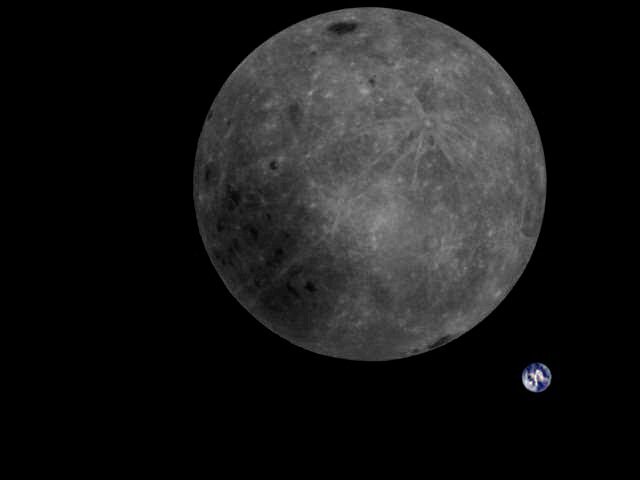 The Chinese government has recently released a new photo giving viewers a rare look at the far-side of the moon with Earth visible at the bottom right. The image was captured by a camera aboard the Chinese DSLWP-B/Longjiang-2 satellite on February 4. The photo was downloaded at the slow speed of less than one kilobyte per minute through the Dutch Dwingeloo Radio Telescope. "Downloading these 16 kilobytes took almost 20 minutes. We did color-correct the original," said one of the telescope operators, Tammo Jan Dijkema, on Twitter. China made history last month when the Chang'e 4 lunar rover touched down on the far side of the moon. Since then, the rover has been giving scientists an unprecedented close look at the mysterious and seldom-seen part of our lunar neighbour. The mission objective is to document the far side of the moon and study the geology near the landing site.